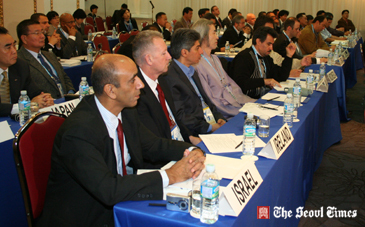 A WTF Joint Technical Meeting is under way for the amendment to the WTF Competition Rules at the Ramada Seoul Hotel in Seoul, Korea on Nov. 14, 2008, with the attendance of more than 60 taekwondo experts from about 30 countries. As part of its ceaseless efforts to make taekwondo more action-packed and exciting, the World Taekwondo Federation held a Joint Technical Meeting for the amendment to the WTF Competition Rules in Seoul, Korea on Nov. 14, 2008. It marked the first time in WTF history that the WTF Joint Technical Meeting was held in an open-discussion format, with the attendance of both taekwondo experts and representatives from the WTF's 188 member national associations. "This is an important meeting, which will shape the future of taekwondo as an Olympic sport. It is time to put our best effort and special attention to placing taekwondo permanently in the Olympic program," said WTF President Chungwon Choue in his speech for the participants. "As I emphasized before, we need the overall amendment of the Competition Rules for more fun, transparent and fair games," Dr. Choue said. "We have now commenced a process of revising the Competition Rules to make taekwondo matches more enjoyable and exciting to both athletes and spectators alike." -the introduction of an instant video replay system.